You may have seen the water fountains at many parks. These fountains give us very good view parks. So, let’s make this interesting fountain at home. This it will be colored and made of foam. We will call it the foamy fountain, and enjoy its beauty! The foam that will be produced by the fountain is special because each bubble is filled with oxygen gas. You will also learn how this fountain works and what science is behind it. Pour ½ cup of hydrogen peroxide in the bottle. Be careful! When dealing with hydrogen peroxide. It can irritate the skin, so it will be advisable to get the help of an adult. Add few drops of food coloring of your choice into the bottle. Add 1 tablespoonful of liquid dishwashing soap into the bottle. Close the bottle with cap, and shake it so that all the liquids mix together. Take a cup and add 3 to 4 tablespoons of water and 1 tablespoon of yeast in it. Stir the cup with a spoon to mix the water and yeast together. When it is time to start fountain, just add water-yeast mixture into the bottle and BOOM! Note: Fountain will expel-out the foam so you should do this experiment at the washable area of your home. When you add the yeast into the bottle which contains the hydrogen peroxide, the breakdown of hydrogen peroxide takes place. The hydrogen peroxide is broken down into water and oxygen gas. The sudden release of oxygen in the bottle causes the bubbling. Because bottle contains liquid soap. These bubbles rush out of the bottle due to the formation of new bubbles. This will until the breakdown of hydrogen peroxide will take place. Increase the amount of yeast added to the bottle. Find out, does it affect the rate of reaction? Increase the amount of Hydrogen Peroxide and also add some water to the bottle. Find out, does it affect the timing of the fountain? What can you do to increase the height of the fountain? Think about it. 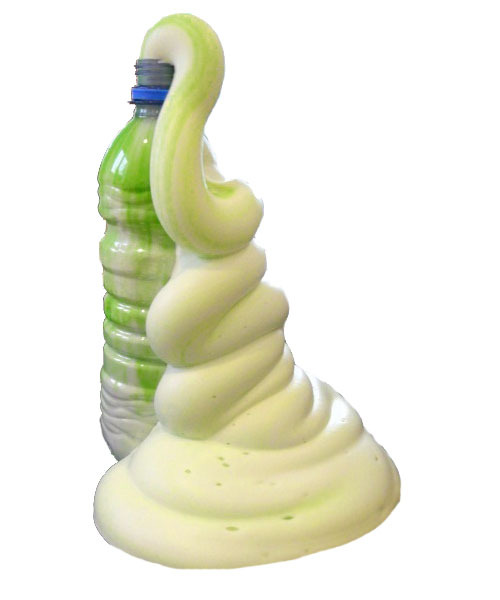 Abdul Wahab, "How to Make Foamy Fountain," in Science4Fun, April 18, 2019, http://science4fun.info/how-to-make-foamy-fountain/. will 3% hydrogen peroxide work for this ? You can use but the fountain will not be effective. On the other hand, higher percentage of hydrogen peroxide will make the fountain more powerful. Thank You! If you really want a huge reaction, just keep the ratio of materials same. You only need to increase the quantity of materials and reduce the bottle’s diameter of opening. For this, you need to choose a large plastic bottle with small opening. Note: if you using a large quantity of material in a weaker plastic bottle, there is a risk of bottle explosion. I would advise to follow all the safety precautions before doing the experiment, or don’t do the experiment.